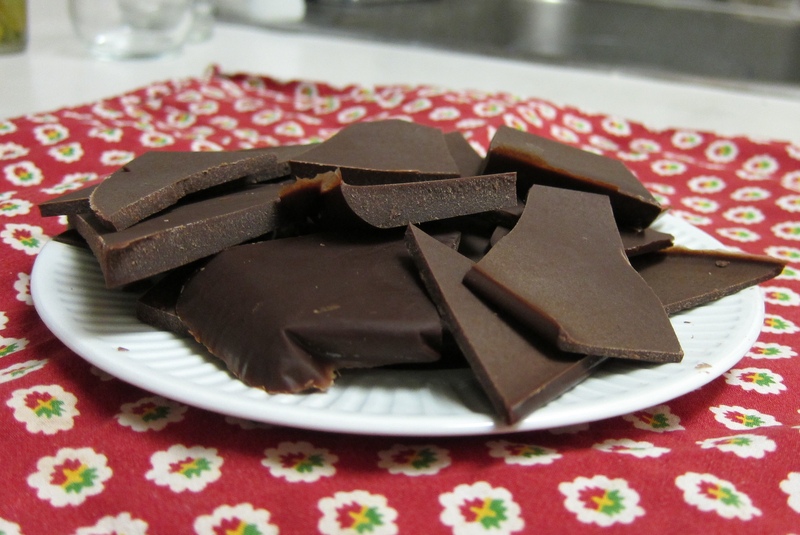 This chocolate recipe comes from Angela. It is fun and easy to make, so easy that it is not annoying to have kids help out. But don’t be fooled by the natural and wholesome sounding ingredients ( “raw cacao powder”, “agave”, “coconut oil”), this recipe is not good for you. Well, it is good in the sense that cacao and coconut oil have some good qualities, but it is high in fat and calories. But it is really good and worth it. Line a 9x12 pan with saran wrap. Whisk ingredients together until thoroughly blended (I usually mix for several minutes, giving each kid a good long turn). Pour mix into pan and spread over whole pan - the more thinly it is spread the better. Freeze for an hour, then break into pieces. Store in fridge or freezer.